Summer is here, and I’ve been having a blast making all kinds of summer-themed cakes! One of my favorite summer cakes is also one of the easiest to make, which is an ice box cake. While I love a good layered cake, sometimes the simplicity of an ice box cake is just so appealing. I’m not sure whether it’s the ease at which it comes together, the short list of ingredients, or how refreshing it tastes on a hot summer day, but it is always such a treat! 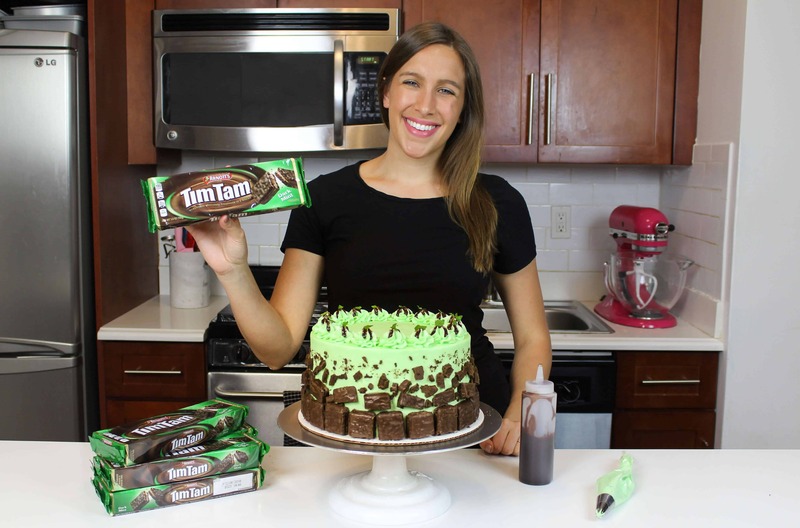 To mix things up a bit, I’ve partnered with Tim Tam® to create a cake that is the best of both worlds! 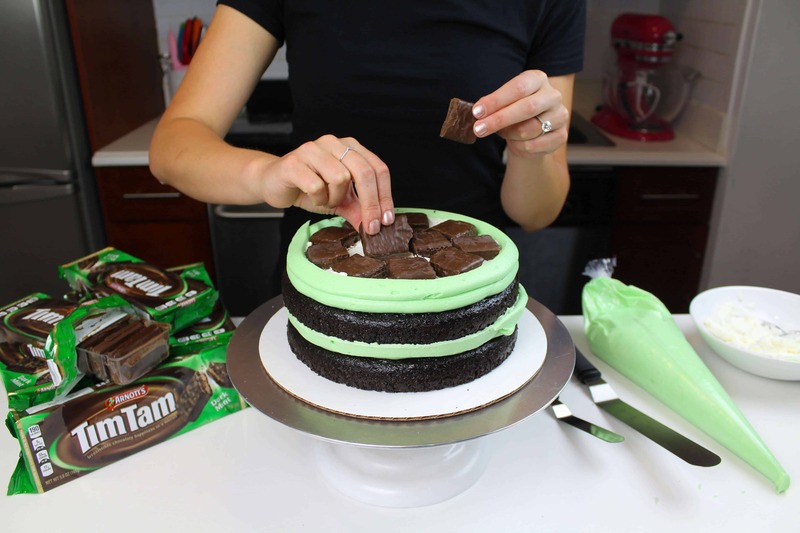 This cake is part layer cake, part ice box cake, and it has a secret ingredient…DARK MINT TIM TAM® BISCUITS! For those of you who haven’t had the pleasure of eating Tim Tam® before, it is an irresistible biscuit that is chocolaty on the outside, crunchy creamy on the inside, and delicious all over! They’re originally from Australia, but are finally available in the U.S. now!! If you want to learn more about Tim Tam® biscuits, or where you can buy them, head over to TimTamUSA.com. While some people enjoy simply snacking on these delicious biscuits, others like to SLAM them! I had no idea what a Tim Tam Slam® was until I saw an Australian Instagrammer do one on Instagram a few weeks ago. People love to bite off each end of the biscuit, and dunk it into their coffee! What surprised me the most is that a #TimTamSlam can be done with a hot or cold beverage. I love this, because I pretty much exclusively drink iced coffee. Since Dark Mint Tim Tam® biscuits were going to be the star of this cake, I wanted to stay on theme, and incorporate a bit of coffee into this cake. I have an amazing chocolate cake recipe that uses an entire cup of coffee, and decided that it would be the perfect base to build this cake. 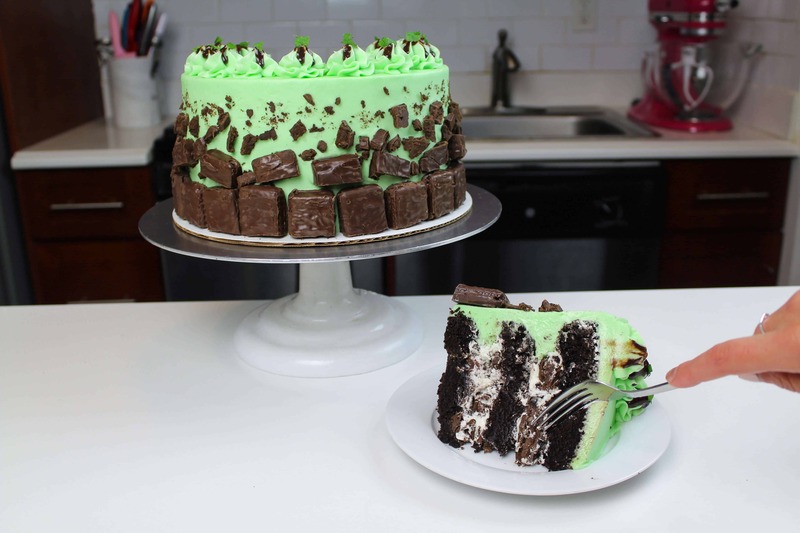 I stocked up on my favorite Tim Tam® flavor, Dark Mint, and went to town adding them into this icebox inspired cake. The whipped cream filling, and fresh mint flavor make this cake such an amazing summer dessert! The full recipe can be found below. Preheat oven to 350 degrees Fahrenheit. Line and grease three eight-inch cake pans. Begin by making the mocha chocolate cake layers. Combine the flour, sugar, cocoa powder, salt, baking soda and baking powder in a large bowl. Whisk together until combined (be sure there aren’t any clumps! If there are, you may want to sift your ingredients). Pour in the coffee and buttermilk into the dry ingredients, until fully incorporated. Add in oil and eggs, and stir until smooth. The last step is to stir in the vanilla. The batter will be on the thin side, but that’s the correct consistency! Divide the batter evenly between the three cake pans, and bake for about 30 minutes. Remove from oven, and let the cakes sit for about 5 minutes. Gently run an offset spatula around the rim of the cake pans to loosen them. Place the cake pans in the freezer to speed up the cooling process, and to trap in additional moisture. 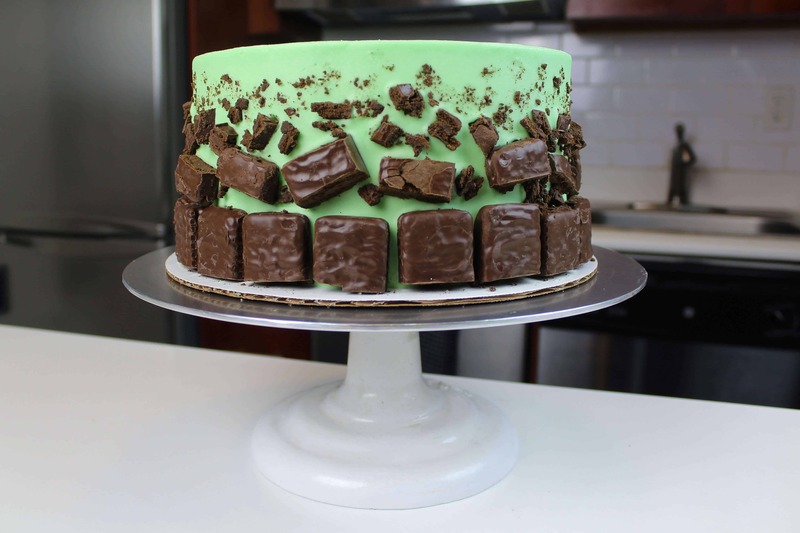 While the cake layers bake and cool, make the mint buttercream. Beat the butter on a medium speed for 30 seconds with a paddle attachment, until smooth. Slowly add in the powdered sugar, 1 cup at a time. Alternate with small splashes of cream. Once fully mixed, add in the mint extract and salt, and beat on low until the ingredients are fully incorporated, and the desired consistency is reached. Mix in the green gel food coloring one drop at a time, to ensure you achieve a light shade of green. Place 1/4 of the frosting into a large piping bag, and trim to have a 1 inch opening. Once the cake layers are cooled and ready for assembly, make the mint whipped cream. Chill a large metal bowl in the freezer for about 10 minutes. Add heavy cream into bowl, and beat on high using a whisk attachment. Quickly add in the sugar and mint extract, and continue to mix until medium to stiff peaks form (should only take about 1 minutes from start to finish). Be sure not to over beat, or else you can end up with butter!! 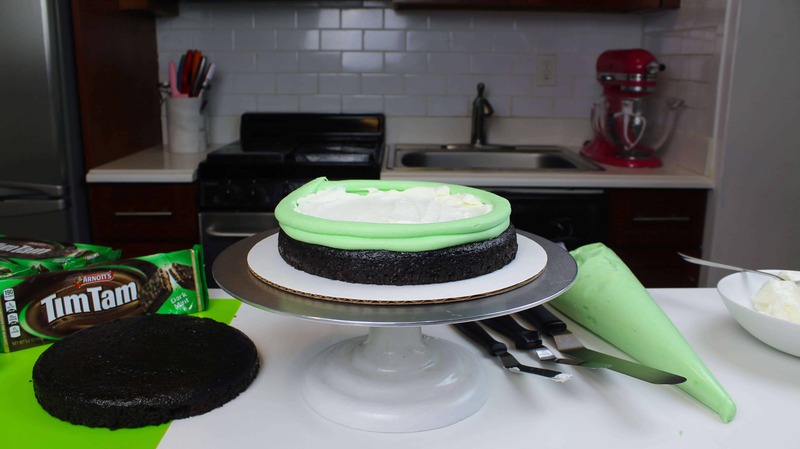 To assemble the cake, place chocolate cake layer on a grease-proof cardboard cake round. Pipe a ring of mint buttercream around the edge of the cake layer, and add 1/4 of the whipped cream into the center of the cake. The buttercream will act as a dam, to keep the whipped cream in place between the layers. It will give the cake stability once it’s assembled, and prevent any whipped cream from seeping out into the crumb coat. Smooth the whipped cream inside the frosting ring using a small offset spatula, and place chopped Dark Mint Tim Tam® biscuits on top on the whipped cream. Smooth an additional scoop of whipped cream on top of the biscuits. Repeat this process with the second cake layer. 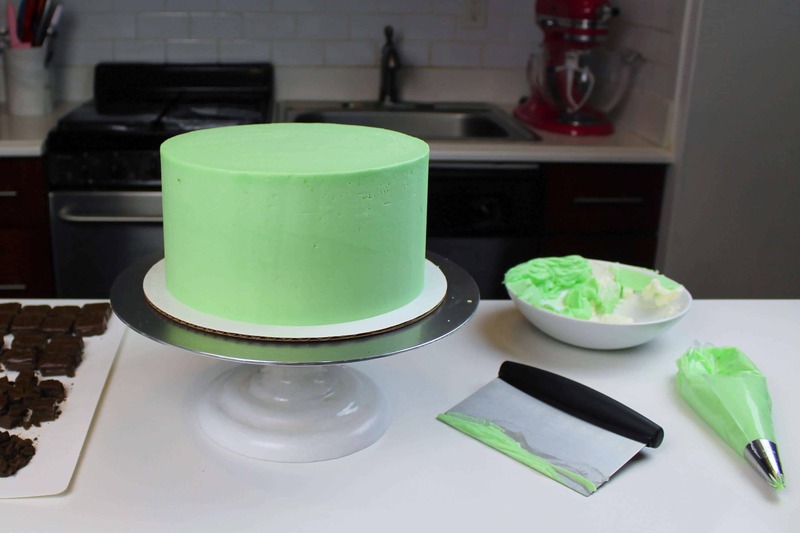 Once all three layers are stacked, cover the cake in a thin crumb coat with the mint frosting, and chill in the freezer or fridge for about 5 minutes. 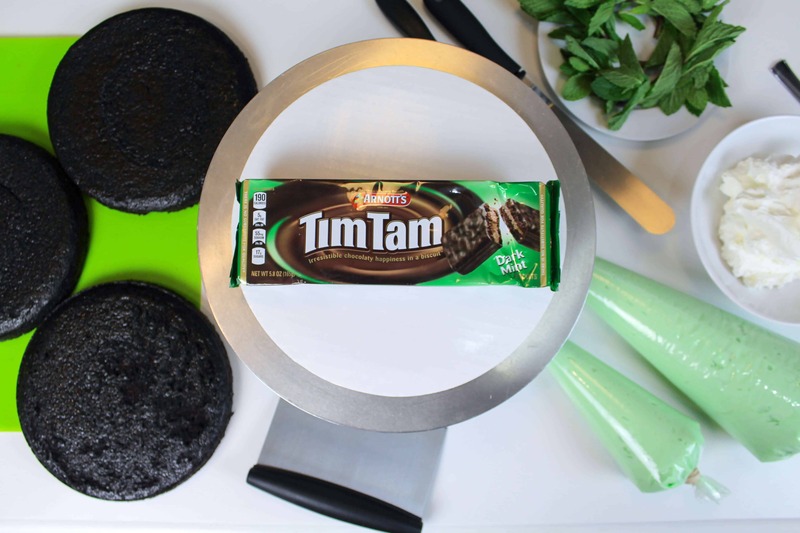 Once smooth, cut up Dark Mint Tim Tam® biscuits into a variety of sizes, to create a biscuit gradient up the side of the cake. Cut the biscuits into four different sizes (halving, quartering, etc.). 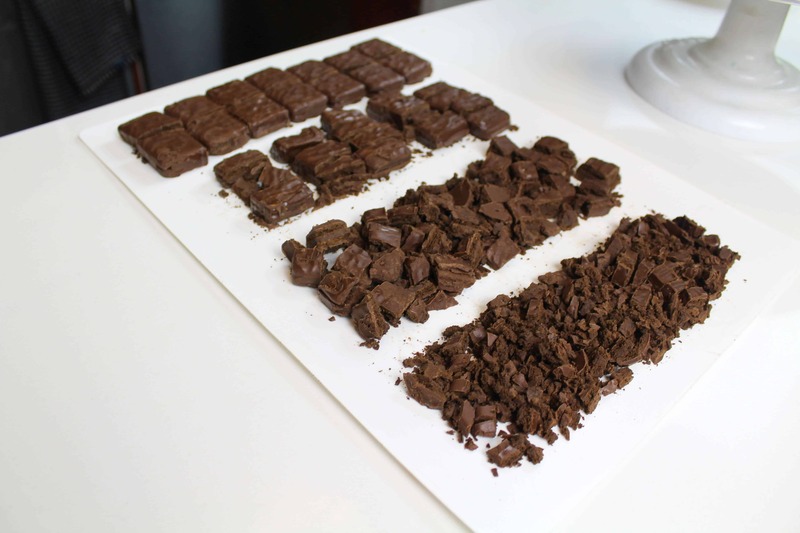 Place the largest bits around the base, of the cake, then slowly work up the cake using increasingly smaller Tim Tam biscuit pieces. Once the entire side of the cake is covered, place remaining buttercream into a piping bag fitted with a Wilton 1M frosting tip. Pipe small swirls around the tops of the cake. If desired, chill the cake for an additional 5 minutes in the freezer, then drizzle a bit of chocolate ganache over each swirl. Top each swirl with a bit of fresh mint leaf. Be sure to let this cake sit in the fridge overnight, to ensure that you achieve the icebox effect in filling of the cake. Take the cake out of the fridge a couple hours before serving, to allow it warm to room temperature. This cake serves about 20 people. If you aren’t a huge fan of mint, you could definitely pick a different Tim Tam® flavor, and omit the mint extract from this recipe. 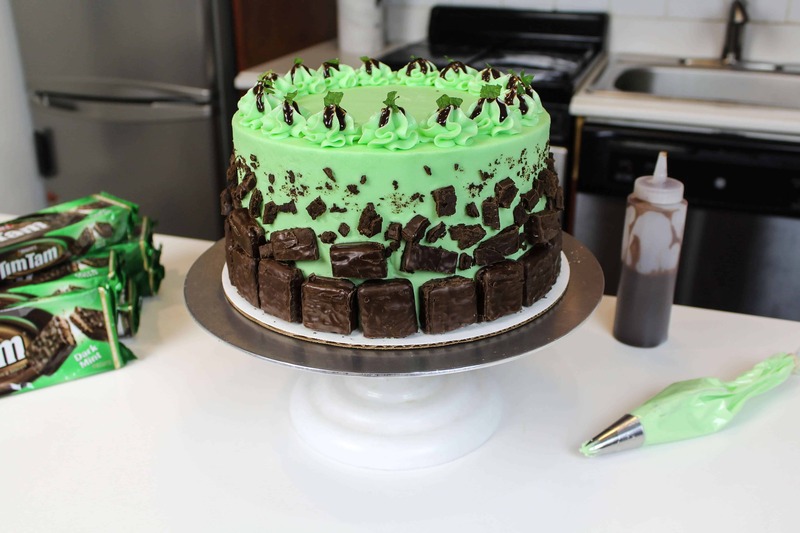 A fun variation would be to use classic Tim Tam® biscuits, and frost the cake with a chocolate buttercream. Hey Chels! I made my first wedding cake a couple of weeks ago. Thanks to your website, video, recipes and tips it was a total success!!! It was a four tier stacked semi naked caked with gold dust embellishments! Thanks again! !